If you’ve been following the blog long enough you know by now that we are Formula 1 fans, and that since W. and I got married, we go to a Grand Prix every year at least once. In fact, our honeymoon included the Abu Dhabi Grand Prix in 2013, and in that year our tradition began. This year was a very different and special one for us, it was the first time we took our baby daughter to a GP and I must say that we loved the experience, and so did she. 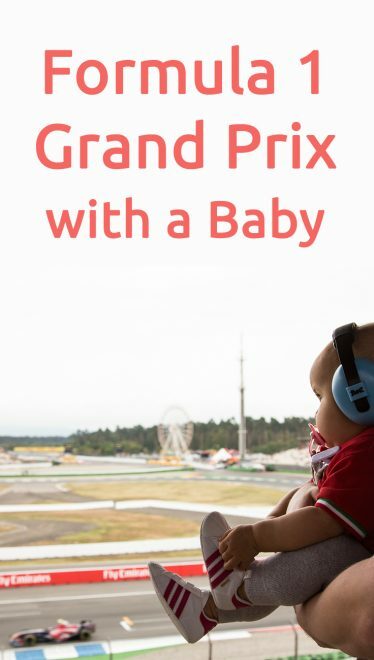 ♦ Check if the Grand Prix accepts babies: some circuits, such as the Brazilian one, only accepts children from 5 years on (see at the end of the post the list I made with the circuits’ policies towards accepting babies). ♦ See if the circuit offers covered seats: the best option to protect your baby from the strong sun or rain. ♦ Find out if near your seats there are nice areas where you can spend time with your baby so you don’t have to be seated the whole time. It can be a park or grass, which is normally easy to find on most circuits. 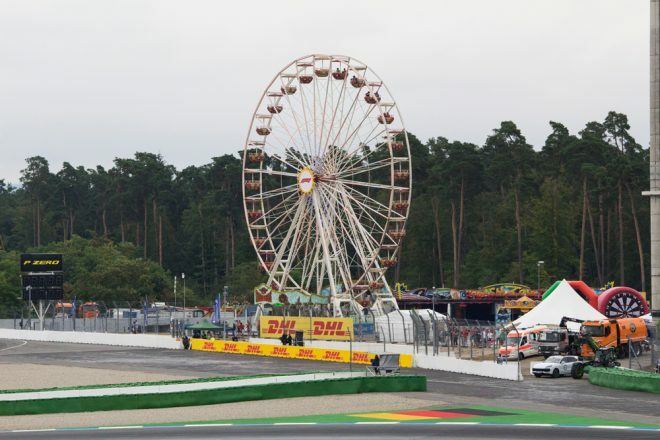 Recently, Formula 1 event organizers introduced the Kids’ Zone, at the German Grand Prix there was even a Ferris Wheels and a fake beach, which is where we spent our time between the sessions. 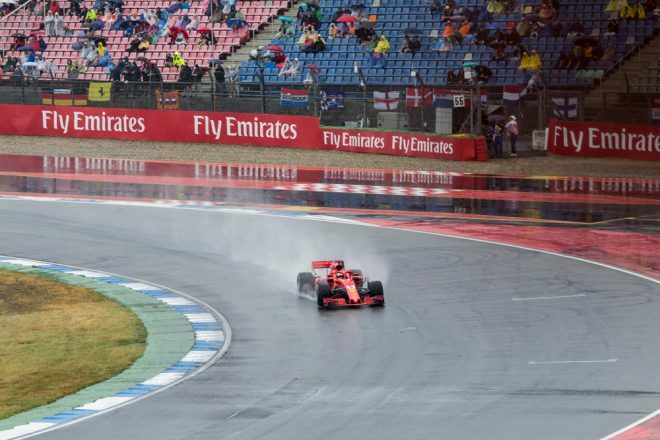 Something that also really helped us to make our decision was the fact that we’ve been to Hockenheim before and were familiar with the circuit. So if you’ve been to a certain circuit before and think it can be a good one to take your baby, go ahead. Other circuits to which we have been before and would definitely take Baby M with us are: Spielberg, Abu Dhabi, Barcelona and Hungary. As for the ideal age, I would say it’s best that your baby can already sit down by themselves, which is about 6 to 7 months old. Baby M was 10 months when we took her, it was a great age, though I even think that at 8 or 9 months could have been even better, because that’s when she was less active (haha). Whenever the cars were on the track, Baby M was wearing her ear defenders, and to our surprise it didn’t bother her to have it on her head most of the time. At first she wanted to play with it, but with time she got used to it and didn’t even realize she was wearing it. She was sleeping during half of the qualifying session and the race! ♦ Apart from the Abu Dhabi Grand Prix, babies don’t pay for a ticket. However, many circuits request that while booking your tickets you also book the “baby ticket”, which is free but needs to be included together with yours. These and other rules you can always find on the circuit’s official website or with your tickets’ provider. ♦ If you’re driving to the circuit, plan ahead in terms of parking: see where is the closest parking space to your seats, and try to go also on the Friday, as depending on the circuit you might get a guaranteed spot for the rest of the weekend (Barcelona’s circuit does that for a fee of 20 Euros). Some circuits offer early booking of a parking spot too. Abu Dhabi GP: allows babies, though a full price ticket is required (!!!). In all other circuits babies have free entrance. 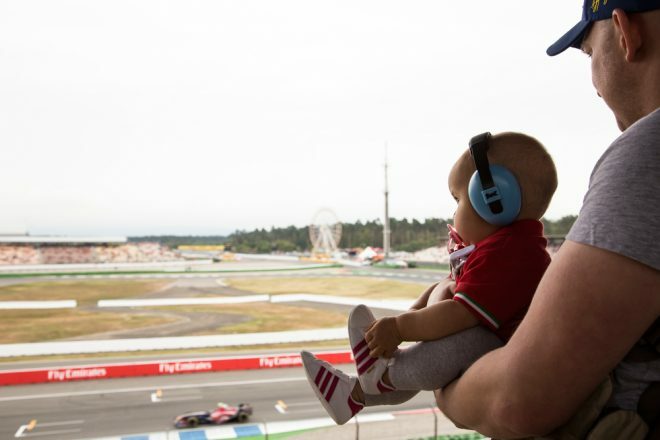 We were excited and kind of surprised to see how many families took babies and kids to the German Grand Prix (we probably didn’t notice it before as we still weren’t parents). Despite the noise, it is definitely a very child friendly event and if you’re skeptical about taking your baby/child to one, don’t be, you will all have a great time. 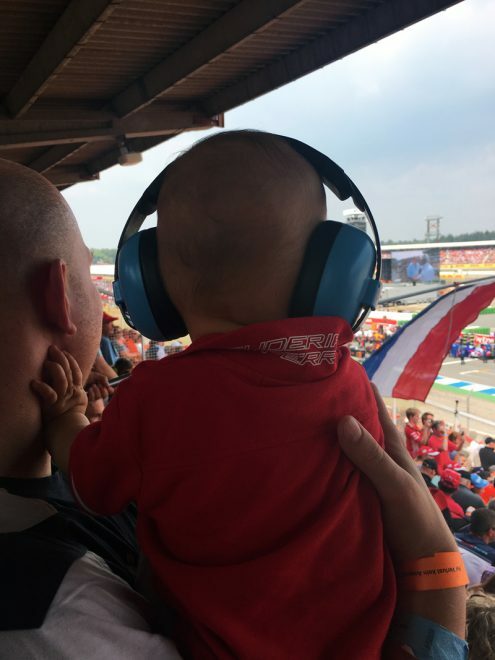 Previous to our decision on taking Baby M to a Formula 1 Grand Prix, I’ve searched the entire web for some tips and honestly didn’t find as many as I’d liked, so I hope this post can help all the parents fans of Formula 1 out there who would like to take their little one along to a race weekend. Have fun!